What is your very first memory? Maybe Christmas morning, I can’t remember that far back! How did you first get involved in track and field? I first got involved in running in 3rdgrade when I had my first cross country race and fell in love with the sport! I did the track and field programs in school from grade 3 onward, and the middle school program, then joined Fast Tracks in 8thgrade. In your middle school years, you competed in a variety of events, including the 200mh, 800m, high jump, and long jump, but as soon as you entered high school, you competed exclusively in the distance events. What made it so easy to decide on distance running once you entered high school? In middle school it was fun to try different events like hurdles and jumping but I always liked the distance events best. In high school when I became more serious about running I decided to focus on distance events simply because it’s what I liked most. I also needed to decide what I wanted to “specialize” in, in order to focus my training around specific events. At this year’s Canadian Legion Track & Field Championships, you finished 7thin the 1500m with a personal best time of 4:41.87, and just narrowly missed a personal best in the 3000m, finishing 6thwith a time of 10:20.21. Take us through both of your races. What sticks out most when I think about those races was the heat, and it kind of blurred my memory of the actual races. In the 1500m I remember going out strong and sticking with the front pack for the best possibility of a personal best. I remember pushing myself so much during the last lap, enough to get a two second personal best. Right when the race ended I was obviously exhausted and my throat was extremely dry, but I was so happy with my result, I knew it was all worth it. The 3000m was also very hot, and I remember just wanting the race to be over. Seven-and-a-half laps is a lot to do in a heat wave, but from doing a 3000m earlier in the summer in Ottawa (at the Canadian Junior/Senior Track and Field Championships) in insane heat, I knew it was possible. Even though I just missed a personal best, I put out my best performance that day, and overall was happy with the result. You dropped down from your main distances to run the 4x400m for Team New Brunswick at this year’s Legion Championships, with the relay team finishing 9thin a time of 4:20.15. How was racing the 400m distance? The 400m has to be one of the hardest races, but I actually had a lot of fun doing it! Relays are always so fun because you get to run as a team. I wouldn’t say I plan to keep racing 400’s individually, but maybe another 4x4 at next year’s Legions! At this year’s NBIAA Cross Country Championships, you won the gold medal and led the Fredericton High School senior girls’ team to a perfect score. Tell us about the team atmosphere and training that led to such a successful team performance. Being on the FHS senior girls team is definitely a highlight of the cross country season. It’s with all the girls I normally race against; that being in the same team is really fun. We all train with our own clubs most of the time, but we all come together to race at NBIAA’s! Alongside Fredericton Fast Tracks teammate Frances Wright, you are set to compete in the youth girl’s 4km race at the Canadian Cross Country Championships, taking place in Kingston, Ontario in late November. What are your goals for the championships? Frances and I are really excited for the championships! My goals are to put out my best race possible, and hopefully that will put me near the top 30 or under. We’re putting in a lot of training before we go and hopefully it will pay off! The 2019 edition of the Legion Championships, taking place in Sydney, Nova Scotia, will be the last edition that you are eligible for. What are your goals for your final Legion Championships? My goal for my final Legion Championships would be a medal. It’s a pretty ambitious goal, but I’ll be putting in the training all year to have my best performance. Thoughts on trying out the steeplechase? I think it’s safe to say I’ll never be a steeplechaser. I couldn’t imagine doing all that distance and jumping over steeples at the same time! Although the water jump seems appealing in the summer, I could never actually do it. I’m tired enough after 1500’s and 3000’s, I wouldn’t survive steeplechase! The 2016 edition of the NBIAA Cross Country Championships marked the first year of the new race distances, with the junior girl’s moving from 3km to 4km, the senior boy’s from 5km to 6km, the senior girl’s from 4km to 6km, and the junior boy’s remaining at 4km. What are your thoughts on the increased race distances? At first I really didn’t like the change, but I’ve since adjusted and it’s not too bad. It makes the races feel more like cross country, rather than a 3 or 4km sprint. You have time to pace yourself and get into the race before it’s even over! The Fredericton Fast Tracks female distance program has evolved in recent years to include a number of rising stars at the Youth level.Take us through a typical day in the life of a Fast Tracks distance runner. Practice starts around 4:45pm and ends around 6:15pm. Usually I warm-up with my teammates Frances Wright and Mackenzie Hall, and we’re always chatting. We do drills together but each have our own routines, and then get into the workout. Each of our workouts is slightly altered to fit our needs. Some days are speed work, long intervals, hills, or all three! Despite Fredericton’s size and population, the city does not have a synthetic indoor or outdoor track, and the municipal government has expressed little interest in constructing one. What do you and your teammates do for training despite not having proper training facilities in the city? How would having an indoor/outdoor track in Fredericton enhance you and your club’s training? In the city we’re lucky to have many parks and trail systems that are great for training on when we can’t make it to the track. It’s awesome to have workouts at Odell Park during the cross country season, but when it comes to the indoor track season it’s not so easy: we practice in the FHS halls or make our way to Gagetown, which is 20 minutes out of the city, to practice at the indoor and outdoor tracks. Having a track in the city would help not only our training, but probably increase the interest in track and field in Fredericton and get more people involved! It would also make it easier to train in the winter months and help our parents out on driving us to Gagetown every week! Aside from running, what are some of your other hobbies? When I think about it, running really takes up a lot of my life! When I’m not running I like to hangout with my friends and family, and travel. Whether it be with running or not, I hope to be able to travel all over the world and visit lots of different countries! 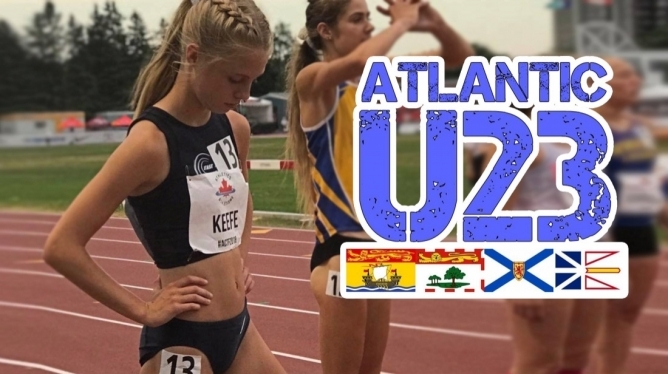 Hosted by New Brunswick-born track runner, administrator, and coach Brandon Scott LeBlanc, AtlanticU23 is an interview series with upcoming Atlantic Canada track and field athletes under the age of 23.